It is a 3 meters Thermometer Sensor/Temperature Sensor, Type : DS18B20 high temp sensor,Silicone sh.. It is a Cigarette Lighter Voltmeter&Thermometer,Input voltage: 12V and 24V Universal,Function:Car ba.. 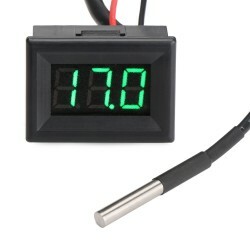 It is a 2in1 Digital Thermometer Voltmeter, Power supply: DC 7~30V, Thermometer Testing range: -10 t.. Large-screen LCD display, simultaneous display of temperature and humidity and time, with the alarm .. It is a -60 ~ 125 ℃ Digital Thermostat,Input Output voltage: 220V AC 30A ,Suitable for greenhouse s.. It is a NTC Thermistor Probe, Type : NTC 10K/B3950 1%, Measurement range : -25°c to 125°c (-13°F to .. It is a Sensitive Stainless Steel NTC Thermistor Probe, Type : NTC 10K/B3950 1%, Measurement range :.. It is a Digital Temperature Controller,Temperature measurement range: -50~110°c,Temperature control .. It is a DC Digital Temperature Controller,Measuring Range 0~50°c,Control range 16~36°c,It has small .. It is a DC Digital Thermometer,Measuring Range -50°c ~ 99°c,It has small size, high efficiency, lon..